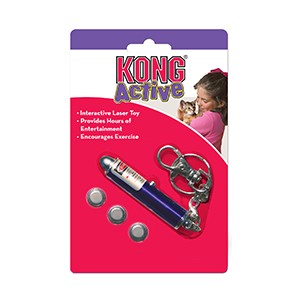 Kong Laser Pointer Interactive Cat Toy helps facilitate interactive play sessions and also provides endless fun. For example. simply point the laser at the floor or wall and let your cat chase and attempt to capture its elusive prey. Thus a few minutes of play every day can help strengthen the bond between you and your cat. Furthermore, ideal for games, training exercises, or both! Laser pointers can be used in Target Training with your pet. Furthermore, this can be in conjunction with using clickers in Clicker Training. Target training is a type of training method used to accelerate how we elicit the behaviour we want, instead of just waiting for it to happen. This is done by using a visual cue to prompt your pet in the right direction. For advice or direction speak to your local Dog Trainer or our friendly Dog Trainers at West Coast Pet Care.